I always seems to be forgetting something. More often than not it’s related to this site and involves something I want to review or research. I’ve started carrying small notebooks and a pen around with me to jot that stuff down because otherwise I’ll forget. I know some of you are probably saying “well that’s what phones are for” but it just doesn’t seem to work for me. I’ve never found a note taking app that I’ve loved (have tried a ton) and always go back to paper and pen. I’ve gone back and forth between Rite in the Rain and Field Notes and am honestly not sure which I prefer… they’re both great. Field Notes are made in the United States which is always a plus as well. The quality on these is superb. I pretty much always have one with me in my pocket and I’ve usually got them finished up before they start separating. This isn’t to say they’re indestructible… they’re still paper, cardboard, and three stables but they meet my expectations in quality. The far right notebook has been in my pocket for the past 4 months or so and still holds up well. 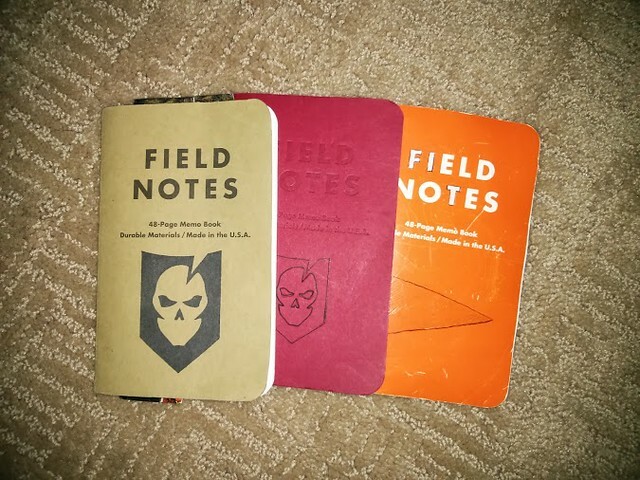 There are three consistent styles of Field Notes. There’s graph paper (my favorite), ruled paper, and plain paper. I much prefer the graph paper because to me it is more versatile. I am an absolute terrible artist so there’s no reason I would ever need to sketch anything in a plain notebook. I’m also a terrible writer (as you probably know by now) so I never need to write out novels. The graph paper is perfect for simple note and idea taking. We stock Field Notes Brand notebooks in our online store. Purchase them there and help support the website. Field Notes has come out with quarterly limited edition offerings to appeal to the collector in all of us. They all follow a theme and can be very cool. If you’re just looking for notebooks I’d recommend signing up for their email list so that you’ll be notified when new ones come out since they sell out like hot cakes. One of my favorites that they created was the Expedition edition which featured waterproof paper. They created some videos to demonstrate what it can and cannot do… and apparently if you have a huge sheet of it you can hold five bricks. Is there anything special with how you log your workouts in Field Notes?